In Isaiah 55:1-5, Isaiah describes the glorious and abundant banquet that God has prepared and bids all to attend — both Israel and the Gentle nations. This banquet is none other than the life offered through the work of his Servant, Jesus Christ. We saw that the way into the feast was to listen and believe. Now we’re going to see that part of that listening and believing is repentance. 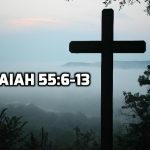 In the Servant Songs, we saw that a Servant would come who would bear our iniquities and inaugurate a new age through his death and resurrection. Now Isaiah invites all to a banquet feast to celebrate and share in the reign of the Messianic King. 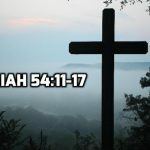 In 54:11-17 Isaiah speaks of a New City to demonstrate that what the Servant accomplished through his death and resurrection not only fulfilled the Old Covenant, but it far surpasses Israel’s grandest dreams. Can believers expect prosperity in this life? What happened to the promises of prosperity in the Old Covenant? When the Servant finished his work of atonement, a new age will be born which promises a prosperity which far surpasses the prosperity of this age.